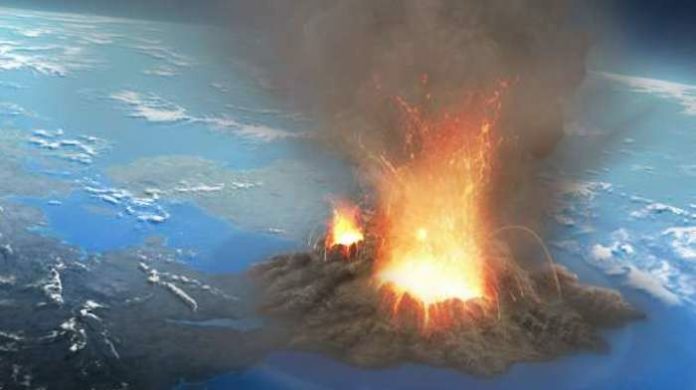 The state of California is sleepwalking towards disaster, according to the United States Geological Survey (USGS), which has released a report stating that a catastrophic volcanic eruption is now “inevitable“. The USGS has previously said that California in dire need of the monitoring of at least 8 active volcanoes. USGS claims that most people are well aware of the fact that California could experience a major and deadly earthquake in the near future, but the complacent general public is less than concerned about a volcanic eruption. “The potential for damaging earthquakes, landslides, floods, tsunamis, and wildfires is widely recognized in California,” the report said according to Newsweek. SHTFplan report: The USGS estimated the risk of volcanic eruption based on the past 5,000 years of volcanic activity in California. The report further found that there is a 16 percent chance of a small to moderate-sized eruption over the next 30 years. As reported by Newsweek, by comparison, there is a 22 percent chance of a magnitude 6.7 or larger earthquake at the San Andreas Fault in the San Francisco Bay Area in the next 25 years. Although one cannot stop a volcano from erupting, preparations can be made just in case this inevitable event happens on our watch. The potentially hazardous volcanoes in California are being monitored closely for any changes that indicate an eruption could be on the way, but that may not give those in surrounding communities much time to get awat from the hazard. Americans by and large have long lost their willingness to prepare for cataclysmic events and natural disasters. “Understanding the hazards and identifying what and who is in harm’s way is the first step in mitigating volcanic risk and building community resilience to volcanic hazards,” the USGS’s report said. This all involves some level of personal responsibility when it comes to preparations. Will a volcano erupt and destroy California tonight? Probably not. But preppers and survivalists understand the need to be ready at a moment’s notice either way. Video: Aliens in Dulce, New Mexico? Did United Nations Troops Attack Person In Alabama Wal-Mart?